What is your career history? Before I became a teacher I used to be in the Women’s Royal Naval Service. I was there when they first sent women to sea. It was quite an interesting time and quite a political time as well. I did seven-and-a-half years in the navy. I still keep up my interest because in my spare time I’m a commissioned officer in the reserve – I control submarines on the weekend and holidays, which is good because it gives you a wider perspective. I got my teaching qualifications and then worked in a variety of schools – maintained and independent. I went to St Alban’s High School for Girls for seven years. I moved to Francis Holland and then came to St Hilda’s in January 2015. I’ve been here four years now, which has whizzed by. What are the best things about being head at St Hilda’s, and the biggest challenges? It’s such an enormous privilege to know that what you’re doing is going to shape the lives of the future generations, and tomorrow’s leaders. 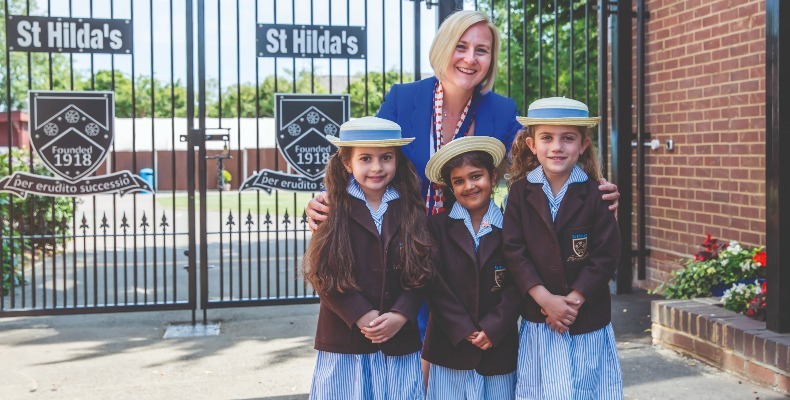 You never know, there could be another female prime minister budding out from St Hilda’s. It’s supporting the staff, as well, and developing their ideas – if they’re fired up, children become fired up about things. The children of now are going to be future innovators and leaders. It’s a real privilege, but it’s also very humbling. I bumped into somebody that I taught and she’s now finishing her master’s. She referred back to a lesson that I taught when she was seven so knowing something that you are doing is having a huge impact is great. Every lesson and every minute counts. That’s the best thing, knowing that every child has got the means to smash through any ceiling as long as they’ve got the right attributes, which we hopefully instil them with here. I think the biggest challenge, counterbalanced to that, is ensuring that the children are fully prepared for an unknown world. With the way the world is changing, it can be really daunting predicting that future. It’s so important that we get it right and we give them the skills to be able to adapt. I think that’s the toughest challenge, trying to predict the unknown, but also that’s quite invigorating. Last year the school reached its centenary. How did you celebrate? We’re still celebrating! We chose to do it for the academic year 18/19 – we can’t find the exact date but we know it was the latter part of 1918. We launched with a centenary ball, with parents, pupils, alumni, past staff. It was fabulous! We’ve also composed a new school song, which reflects what this school’s about, and everybody was involved. I came up with an idea and the director of music over the summer composed a melody. Then we spent half-term working with the children, asking them what St Hilda’s means to them. They all wrote little snippets and anecdotes that in turn have been turned into the lyrics for the song. It’s such a crucial time, to be 100 years old as a girl’s prep school. It’s really humbling actually. You look at the past headmistresses (I daren’t think what the collective noun for that is!) and think, each one has made the school what it is today. That’s really exciting; you’re setting up the springboard for the school’s second century. We’ve got other things planned too including a big surprise for the girls in March, an alumni afternoon tea in the summer, and we’re commissioning an artist to come and work with us later this term. She’s going to work with every girl and every member of staff. We can then have something for the future, so that girls in 50 years’ time when the school’s celebrating its 150th, can go ‘oh, look, I wonder who that was?’ We’re going to be exhibiting at the local museum as well. It is amazing to be part of it and it’s great to have so many people being so positive about the school. The girls are really excited by it. They’re each doing a class assembly and they’ve got a decade in the school’s history that they’re researching. I think it’s a good way of teaching them about the past and how important the past is in influencing our future. What are your future plans for St Hilda’s? While there’s the traditional three r’s of arithmetic, reading and writing, we have our own St Hilda’s three r’s of risk taking, resourcefulness and resilience. They’re three things that I think are absolutely imperative that the children have for the future – if you’ve got those skills, you can adapt. The ethos of the founding headmistress is still very much embedded in everything we do. Her name was Violet Curry, and her desire was to prepare pupils for the future, whatever that may be. We’re going to work with the girls to make sure they achieve their very best. We do get very good academic results and I think a big part of that is because the children know who they are. They know their strengths and weaknesses, and they play towards them. What makes St Hilda’s stand out? We have an amazing team and family here. We’re a small, one form entry school that packs a big punch! People are always involved in doing something. Today I was walking around the school and form five were working with reception, the reception children were reading to the form five, but if they were a bit nervous the form five girl would read a story to them. It’s building that sense of community. I know all the girls by name, and the parents; everyone’s working together to develop each individual child. I think that’s what makes us stand out. Everybody who walks through the doors says, ‘what a lovely atmosphere’, and it’s difficult to put into words why that is. I think it’s attributable to the fact that we’ve created a nurturing caring space that helps the girls flourish. I think the real key thing is this family feel, the fact that everyone who works here has a real true desire to make the educational journey an amazing one for every child.